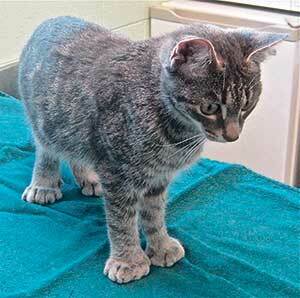 Recently two abandoned cats were brought into the clinic and interestingly one of them was polydactyl. Polydactyl literally means ‘many toes’, and these cats are born with 2-3 extra toes on each paw, giving them huge feet. They will commonly have 7 toes on the front paws and 6 on the back paws giving a total of 26, whereas a normal cat would only have 18 toes. Polydactyly is caused by a genetic mutation and is common in eastern US and southern England. Traditionally these cats were favoured by sailors, and known as ships cats, because of their superior hunting abilities. They were good for rat control on the ships and some sailors considered them to bring good luck when at sea. Other folklore refers to them as witches cats. Well known author Ernest Hemingway was a fan of polydactyl cats, after being given a six-toed cat by a ship’s captain. When Hemingway died, his home in Florida became a museum and a home for his large colony of polydactyl cats, sometimes referred to as “Hemingway Cats”. In my experience these cats have great outgoing personalities and the only downside is that they may need to have their claws trimmed on a regular basis to prevent them becoming ingrown, but anyone with a polydactyl cat is surely very lucky.